There are plans to visit the complex-looking satellite, arriving in 2034. Scientists looking to build on the legacy of the first Apollo moon landing, 50 years ago this summer, are turning their attention not only back to the moon and Mars, but to the prospect of visiting much more distant worlds. One is Saturn’s giant moon Titan, about which very little was known when Neil Armstrong and Buzz Aldrin first set foot on the moon in 1969. “Fifty years ago, all we knew was that it had an atmosphere that contained methane,” Ralph Lorenz, a planetary scientist at Johns Hopkins University’s Applied Physics Laboratory in Laurel, Maryland, US, said at this week’s 2019 Lunar and Planetary Science Conference (LPSC), in The Woodlands, Texas, which is also celebrating its half-century. 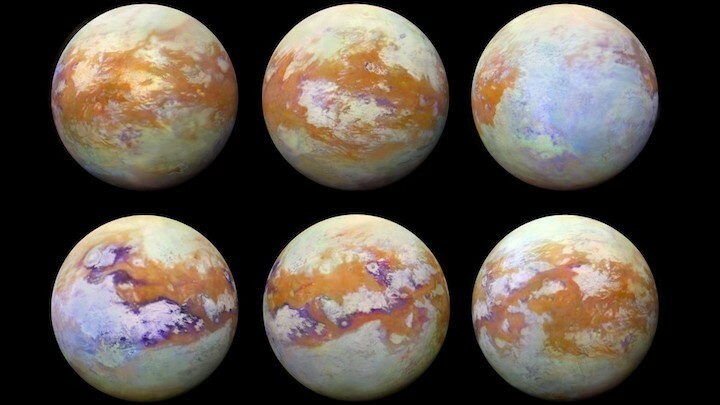 Since then, astronomers have learned, thanks largely to 126 flybys by NASA’s Saturn-orbiting Cassini spacecraft, which orbited the planet from 2004 to 2017, that Titan has sand dunes, lakes, seas, streambeds, and features that look like dry lakes and volcanoes. Not that its surface is water-carved. Rather, the fluid at work appears to be liquid methane, which falls from its skies like earthly rain, to scour the surface and feed the seas. “There’s really a lot going on,” Lorenz says. With its thick atmosphere, it’s also a world made for landers, as was demonstrated when the European Space Agency’s Huygens probe, carried by Cassini, easily parachuted to the surface in early 2005. But Huygens wasn’t designed as a rover, or for that matter as a permanent base, only surviving 90 minutes before it succumbed to the elements. And much as Cassini and other post-Apollo studies have taught planetary scientists about Titan, they’ve only whetted their mouths for more. "Titan has been transformed since Apollo from a dot in the sky to a diverse and rich world, ripe for further exploration by a variety of robotic vehicles, and one day, by humans directly," Lorenz says. Already, he adds, several proposals have been floated for how to return there, ranging from a traditional lander to a hot air balloon. There’s also been a proposal to splash down a robotic float into one of Titan’s seas, to explore it and its coastlines. At the moment, however, the leading candidate is a project called Dragonfly, a robotic drone that can fly and land, at will. The machine, which, if it gets final approval, would probably launch in 2025 and reach Titan in 2034, is an octocopter, meaning that unlike a traditional drone, it has eight rotors, allowing it to survive if any one of them fails (and, possibly survive if even more fail, so long as at least one of each its four pairs remains operative). “In some ways this captures the features of a lander and a balloon,” says Lorenz, who notes that it allows the aerial views, but also can land and take samples or other surface measurements, as desired. Not that Titan is the only place to which scientists would love to return with a robotic explorer. When NASA’s New Horizons spacecraft flew by Pluto in 2015, it returned images of an unexpectedly complex world, with blue skies, giant mountains, nitrogen glaciers, and an active geology. “It begs for a return mission,” says Dale Cruikshank of NASA Ames Research Center, Moffett Field, California.